We think the new look for opentaps applications is a lot better and hope you agree. For Java developers, we’ve added support for hibernate caching and Java wrappers for ofbiz services and Java classes for constants to make your code easier to write and easier to maintain. opentaps is now available on Amazon Elastic Computing Cloud (EC2). Watch the “opentaps on Amazon EC2″ video to find out how easy it can be to set up a pre-installed demo of opentaps in minutes. For those of you who would like to use opentaps with the award-winning Magento eCommerce system, the opentaps-Magento integration is now ready for testing. The Apache OFBiz eCommerce application is still included out of the box with opentaps, and we will be looking at integrating with other shopping cart systems such as Spree, Zencart, and osCommerce as well. opentaps Version 1.4 is Coming! 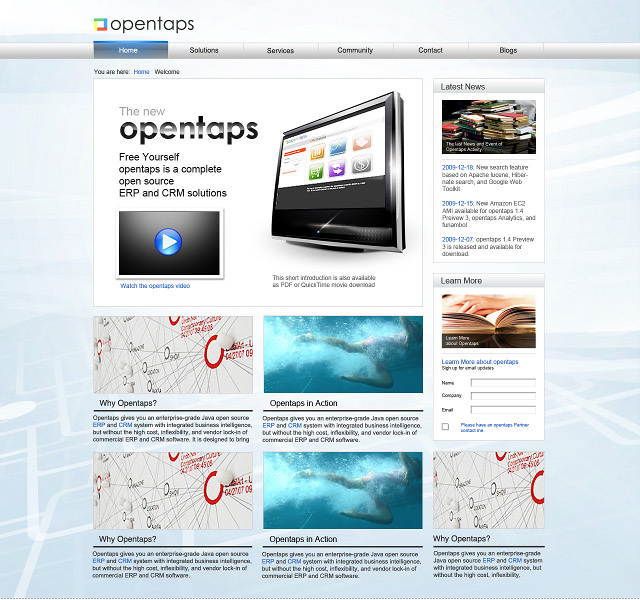 opentaps 1.4 Release Candidate is now available for download, and opentaps Version 1.4 will be released shortly. We’ve already started thinking about opentaps 2.0, which will have a more modular architecture to allow add-on modules written in any framework or language to be loaded and used with opentaps. We’re also looking at how to leverage the domain driven architecture and Google Web Toolkit to create a new kind of ERP application. Please give us your feedback and help us build the next generation of enterprise software.